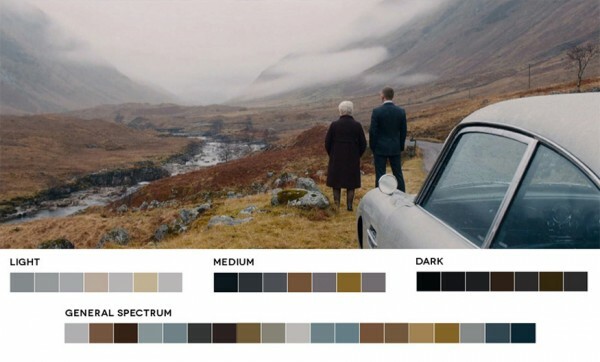 Color palette for Skyfall, from Roxy Radulescu’s blog, Movies in Color. The idea started when I was watching Skyfall. I was taken with the cinematography and use of color more-so than the story itself. I wanted to find out what colors made up certain stills and after making a few color palettes for Skyfall, took it a step further by extending it to all films and starting a blog. So far, the blog has not only been an aesthetic pursuit but also an educational pursuit that showcases the relationship between color, cinematography, set design, and production design. Overall, it is a study of color in films, but has other uses and applications. One of the goals is to give artists color palettes they can use in paintings, films, videos, graphic design, and other pursuits. The still images he’s chosen are beautiful in terms of both color and composition, and are a wonderful resource for thinking about a film’s color palette in preproduction. Categories: Film | Tags: film art design, preproduction | Permalink.